Marco Suvilaakso is the Chief Strategy Officer for Polar with more than 20 years of international business, product development, and marketing experience. His commitment to advancing technology and pioneering the future standard for fitness and sports began during his previous work leading business development and marketing teams in the mobile telecom sector, and it was later solidified during his successful, groundbreaking years at Polar. This extensive experience coupled with a passion for sports and fitness technology has uniquely positioned Mr. Suvilaakso at the forefront of the wearable tech and heart rate monitor industry. 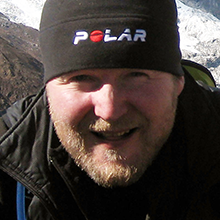 In 2002, Mr. Suvilaakso was tapped to lead – from conception to execution – Polar’s global running product category, effectively making it one of the company’s most successful offerings. He continued to play an integral role at Polar through major milestones, including the world’s first phone-syncing sports watch/heart rate monitor in 2006, and the first integrated training system alongside original smart activity monitors in 2007. Mr. Suvilaakso is a proponent and expert of the future of sports and fitness technology, and enjoys traveling the world to provide insight into this growing industry. In his free time, Mr. Suvilaakso enjoys back-country trekking, mountain biking, history books and cooking.